The 1st Machine Gun Battalion was formed in early 1918 and consolidated the Machine Gun Companies of the three brigades within the Division; the 1st, 2nd and 3rd. Initially, each Infantry Brigade had a Machine Gun Company under command, bearing the same numeric designator as its parent Brigade. Machine Gun Battalions were formed later; they were Divisional units attached to the Division with the same numeric designation. The elements of the MG Battalions and Companies were allocated to sections of the line in detachments of varying sizes depending on the task, but generally as a minimum in pairs as a 'section'. A section would be two guns and their crews (generally three men per gun). MG Companies and Battalions were equipped with the legendary Vickers Medium Machine Gun. This weapon was served by a crew of three and mounted on a tripod. It was not easily portable and was generally sited in a prepared fixed position. Its direct counterpart on the German side was the Maxim 'Spandau' MG08, a weapon of similar appearance and capability. Both the Vickers and MG08 had a distinctive appearance largely because of a cylindrical water jacket sleeve around the barrel which was designed to cool the barrel when firing at the rapid rate. 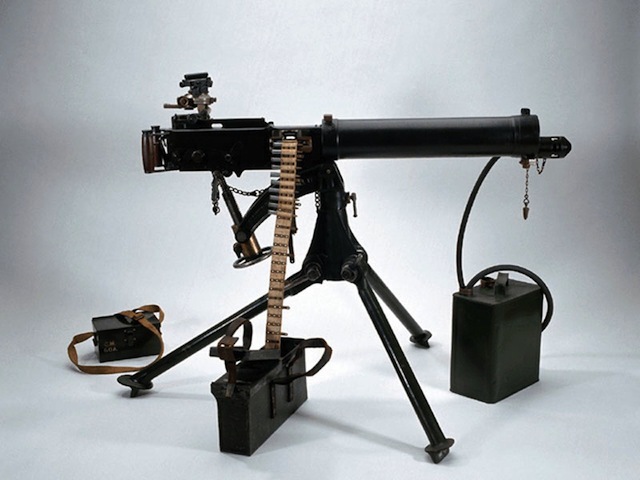 The MG08 was mounted on a characteristic 'sled' rather than the tripod of the Vickers. They achieved continuous fire through the provision of ammunition in canvas belts (see photo). The Vickers was renowned for its reliability and it could maintain blistering rates of fire for extended periods, thanks to its robust design and the fact that it was water-cooled. These weapons were capable of firing at extended ranges, out to 3,000 yards. They would be sited to provide flanking fire across a defensive front, often covering belts of barbed wire or other obstacles forcing the enemy to attack through their line of fire with devastating results; a tactic known as "enfilade fire". It was largely the effect of well-sited German machine guns that caused such devastation among the attacking British and Dominion formations on the first day of the Somme offensive in 1916. The British "Pals" Battalions at La Boiselle and the Newfoundland Battalion at Beaumont Hamel were cut to ribbons by machine guns over 2km to their flanks that they would not have been able to hear firing at them. They were often the lynch-pin of defensive positions and thus the object of enemy attempts to neutralise them as a prelude to attack, by mortar, artillery fire or even raids by parties of grenadiers with hand and rifle grenades. In attack they would be sited to provide indirect 'plunging fire' into enemy positions in depth at long range to prevent enemy reinforcements reaching the objective of the attack, or to disrupt attempts to withdraw, in a manner not dissimilar to artillery. 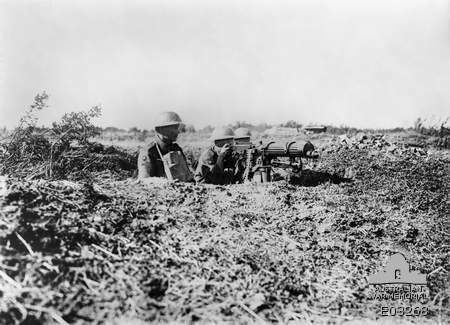 Some machine gun teams would also be assigned to follow the assaulting formations where they were to establish themselves in order to provide defensive fire across the front of the "limit of exploitation" of the attack as protection against counter attack by the enemy. Machine guns and artillery between them were the dominant influences on the battlefields of the Great War until late in the war when manoeuvre regained importance with the advent of armoured vehicles and ground attack aircraft that could suppress enemy defences.